It’s hard to go wrong with any recipe that combines chocolate, berries and muffins, if only because there are few things we love more than an excuse to enjoy chocolate. These delectable treats are no exception. We were first tempted by a variation of these muffins our friend had made, and couldn’t resist trying our hand at something similar. Each bite is moist and creamy, with sweet chocolate chunks that balance out the slightly tart flavor of the berries. They are perfect for breakfast or brunch, or even as dessert, since they satisfy our sweet tooth. You’re bound to be surprised at just how easy it is to whip these goodies up! 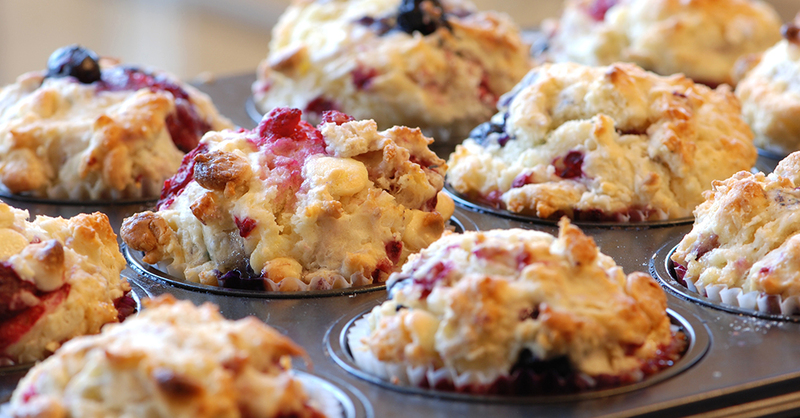 Preheat oven to 350º F and fill your muffin tin with cupcake liners. Combine milk, oil and egg in a large bowl and whisk together until combined. In a separate bowl, whisk together flour, baking powder, salt and sugar. In batches, gradually mix the dry ingredients into the wet, stirring until just incorporated. Fill each cup of a prepared muffin tray with the batter. Place in oven and bake for 20-25 minutes, or until toothpick inserted in center comes out clean.